Marvel Studios’ newest film The Avengers is just about as massive as a film can get. Heroes are assembled, villains are challenged and cities are destroyed. 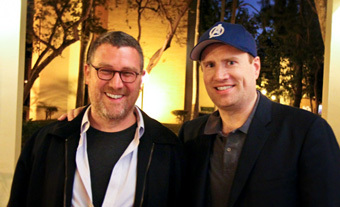 However, when the president of Marvel Studios, alumnus Kevin Feige ‘95 visited with Leonard Maltin’s 466 class on April 26th, he said that he still thinks about being economical. The Avengers debuts nationwide on May 4th and is already breaking box office records overseas. The pre-sale tickets for the movie have outsold all of the other Marvel films combined. Beyond the exemplary visual and sound design of the film, Marvel Studios remained conscious in building the story and its characters. The screening was part of Leonard Maltin’s 466 class.